Making Public Space Where It Should Be | whitespace.
. Published on April 20, 2014 . Sometimes public space needs just needs a bit of help. As New Orleans begins to fill in the gaps, and its population resurges to pre-storm levels, public space is adapting to address the needs of these new found inhabitants. Working with local community partners, Gould Evans New Orleans has helped to envision what a new market would look like in the well-known, downtown public space, Lee Circle. 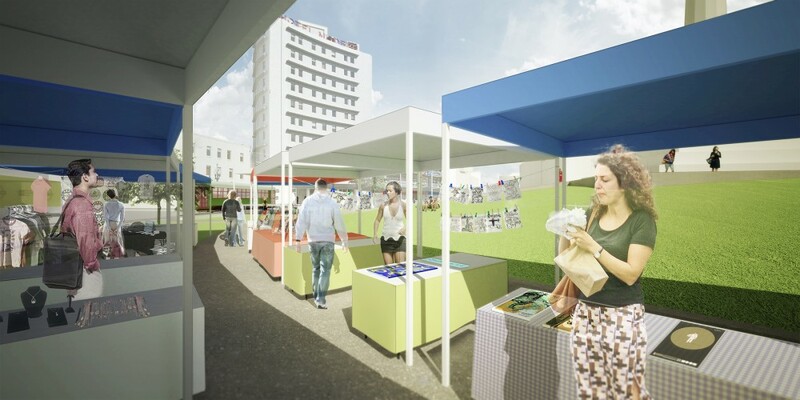 With very little infrastructure, and even less “architecture” the market plans to operate once a month and turn the under utilized public space into a vibrant market. It is these types of spaces that seem to be the bellwether for future development, giving them relevance and making planners, designers, city officials, and citizens take notice. Not all of the projects that take advantage of these in-between spaces are glamorous, but they confront the same issues a large intervention would need to address.